Real Madrid scored a late winner to beat Valencia and take another step towards the La Liga title. 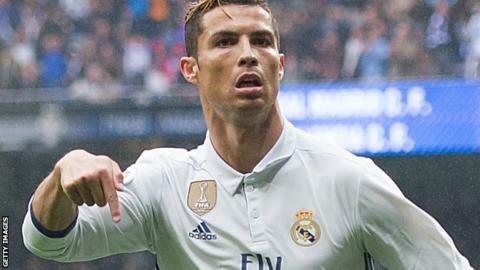 Cristiano Ronaldo struck early for Real - making him the all-time leading scorer in Europe's top five leagues - but missed a second-half penalty. Dani Parejo equalised on 82 minutes but Marcelo's late curling effort secured the win. Real stay second in the table behind Barcelona, who beat Espanyol 3-0 later on Saturday. However, Real will claim the title if they win each of their remaining four league matches as they have a game in hand on Barca. Zinedine Zidane made nine changes to the Real side that beat Deportivo La Coruna 6-2 on Wednesday, with Ronaldo and Luke Modric among the returnees. Ronaldo headed Dani Carvajal's fine cross beyond Diego Alves to record his 20th goal of the La Liga season. It was also the Portuguese's 367th league goal, surpassing England, Tottenham and Chelsea striker Jimmy Greaves, who scored 366 goals between 1957 and 1971. The home side increased the pressure after the break, forcing Valencia to concede a penalty after Parejo brought down Modric, but Alves got down quickly to save Ronaldo's low strike. Parejo's free-kick looked to have ended Valencia's four-match losing streak but Brazilian full-back Marcelo kept his composure to curl the ball beyond Alves from 18 yards out. Real next face city rivals Atletico on Tuesday in the Champions League semi-finals, while 12th-placed Valencia host bottom-of-the-table Osasuna on Sunday 7 May. Real Madrid boss Zinedine Zidane: "Valencia kept playing their game and we couldn't find the second goal to kill the game off. We're going to have to dig in until the end. "If you don't finish the game off, you're going to struggle. We had chances to close the game out earlier, so that's something we can still improve on. "It's true that we had half-an-hour when we slipped into our comfort zone, but that changed after the Valencia goal." Match ends, Real Madrid 2, Valencia 1. Second Half ends, Real Madrid 2, Valencia 1. Substitution, Real Madrid. Lucas Vázquez replaces Luka Modric. Corner, Valencia. Conceded by Daniel Carvajal. Offside, Real Madrid. Álvaro Morata tries a through ball, but Marco Asensio is caught offside. Substitution, Valencia. Zakaria Bakkali replaces Fabián Orellana. Attempt blocked. Casemiro (Real Madrid) right footed shot from outside the box is blocked. Assisted by Toni Kroos. Goal! Real Madrid 2, Valencia 1. Marcelo (Real Madrid) right footed shot from the centre of the box to the bottom right corner. Assisted by Álvaro Morata. Substitution, Valencia. José Gayá replaces Toni Lato. Attempt blocked. Luka Modric (Real Madrid) right footed shot from outside the box is blocked. Goal! Real Madrid 1, Valencia 1. Daniel Parejo (Valencia) from a free kick with a right footed shot to the top left corner. Luka Modric (Real Madrid) is shown the yellow card. Fabián Orellana (Valencia) wins a free kick in the attacking half. Delay in match Cristiano Ronaldo (Real Madrid) because of an injury. Delay in match Toni Lato (Valencia) because of an injury. Attempt missed. Cristiano Ronaldo (Real Madrid) with an attempt from very close range is just a bit too high. Assisted by Marco Asensio with a cross. Álvaro Morata (Real Madrid) is shown the yellow card for a bad foul. Daniel Carvajal (Real Madrid) wins a free kick in the attacking half. Santi Mina (Valencia) wins a free kick in the attacking half. Offside, Real Madrid. Marcelo tries a through ball, but Marco Asensio is caught offside. Substitution, Real Madrid. Álvaro Morata replaces Karim Benzema. Attempt missed. Rodrigo Moreno (Valencia) header from the centre of the box misses to the right. Assisted by Ezequiel Garay. Substitution, Valencia. Rodrigo Moreno replaces Nani. Attempt missed. Marcelo (Real Madrid) right footed shot from the left side of the box misses to the right. Attempt blocked. Cristiano Ronaldo (Real Madrid) right footed shot from outside the box is blocked. Assisted by Marco Asensio. Substitution, Real Madrid. Marco Asensio replaces James Rodríguez. Martín Montoya (Valencia) wins a free kick in the defensive half. Attempt blocked. James Rodríguez (Real Madrid) left footed shot from outside the box is blocked. Eliaquim Mangala (Valencia) is shown the yellow card for a bad foul. Luka Modric (Real Madrid) wins a free kick in the attacking half. Foul by Eliaquim Mangala (Valencia).